Third basemen in the Cubs’ system struggled mightily in terms of performance/production in 2018. While Jason Vosler hit an organizational leading 23 HRs with 93 RBI, it was rough elsewhere. Injuries and adjustments looked to be the order of the day. 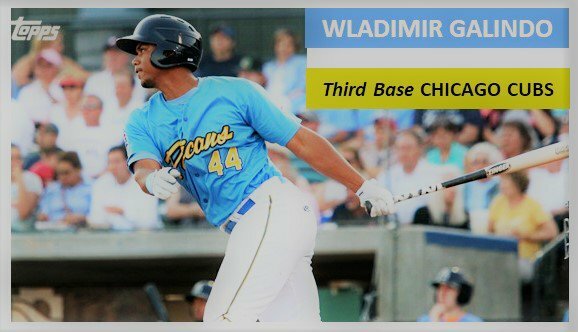 A year ago, I thought Wladimir Galindo would have a breakout year at Myrtle Beach if he could just stay healthy. He struggled with nagging injuries again. At #2, Jason Vosler surprised everyone again as he hit 20+ HRs for the second straight year. He was traded to the Padres in November. Things did not go well at all for last year’s #3 pick Jesse Hodges at AA. 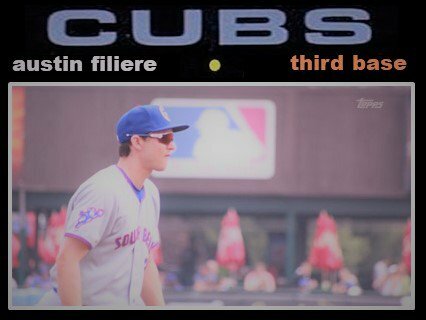 Down at South Bend, Austin Filiere, who was in the #4 slot, was an up and down guy in his first full year in the system. A 140 game grind takes some adjusting. Now with 2019 in sight, the position looks to be in flux from the recent power hitter stereotype into guys who can get on base. In addition, the Cubs have a lot of versatility in the lower parts of the system. As a result, what we may think of as a traditional 3B also plays some 2B, maybe some 1B, and the occasional OF or SS. Very few players just play 3B anymore. When it comes to ranking the corner men after the Vosler trade for 2019, it’s a bit of a struggle. 1. 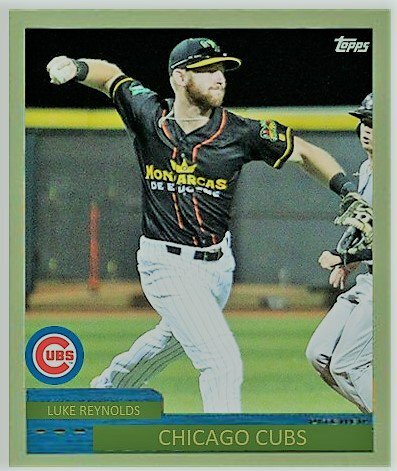 In the long run, 2018 draftee Luke Reynolds might be best suited to 1B. But for now, the former Southern Mississippi product is listed at 3B. Reynolds has a lefty hitting profile and approach that could surpass Vosler’s production in the next two years. At Eugene in 2018, he put up a wRC+ of 127. It will be interesting to see just exactly where he begins 2019. It could be South Bend or it might be Myrtle Beach. However, he will be 24 when the 2019 season starts, which gives Myrtle Beach the edge. Once that is settled, it will be interesting to see how much 3B he actually ends up playing. 2. He’s still my guy, but Wladimir Galindo had nagging injuries again in 2018. Luckily, it was not a broken leg, so he was able to gain experience with 403 ABs. He put together a nice run in June when he hit .290 in 26 games with 1 dinger and 11 RBI and an OPS of .753. I’d like to see more months like that because that is who I think he really is. The guy who hit .194 in the second half. I do not know him and I do not want to, either. I like the guy who can go gap-to-gap and occasionally drive the ball over the fence. 3. Austin Filiere looked like he was going to have a monster year after a terrific April where he hit .310 with a .403 OBP. And then May hit where he played 31 games. That’s a lot of baseball for any MiLB hitter. The effect showed in June where his average plummeted to .207 for the month which also included making a swing adjustment. He rebounded some in the second half to hit .256 in July and .267 in August . I still like Austin as a hitter. As long as he stays within himself, that will be the key going forward. Also, he seemed to thrive when he batted third, he hit over .300 with an OBP of .388. If there is one thing to like about Filiere’s first full year, is that he drew walks at a 10.2% rate, regardless of his average. That’s not bad. I am looking forward to see how he adjusts to that initial season and what changes he worked on this winter. 4. Fidel Mejia tore it up at the plate in Mesa in the Arizona Rookie League. In just 50 games, he hit .324/.389/.410. Not bad for a kid listed at 5’11” and 160 lbs. He is in play for Eugene for 2019. 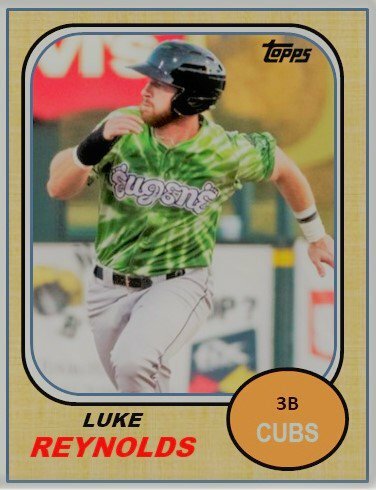 The Sleeper: As for Jake Slaughter, he’s grown quite a bit since the Cubs drafted him out of high school two years ago. 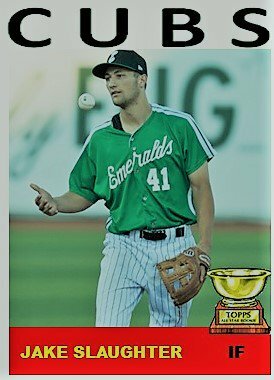 He went to LSU and the Cubs took him again last summer and signed the 6’3” 200 lb. 3B. He looks to have been working out quite a bit. After a very rough July at Eugene, Slaughter hit .263 with 1 HR and 11 RBI in 22 games in August. He looked much improved. Hopefully, those last 6 weeks in which he hit over .270 can act as a springboard for him in 2019. He will definitely have a lot of competition to find a place to play at South Bend come the spring.